Senator Mike Rounds Meets with IAVA Leaders in Washington D.C.
Washington, DC (June 8, 2018) – This week, Iraq and Afghanistan Veterans of America (IAVA), the leading voice of the Post-9/11 generation of veterans, testified on legislation to initiate support for injuries from burn pits and other toxic exposures, and continued to advocate for its Big 6 priorities during its quarterly Storm the Hill. Earlier this week, IAVA members and leadership met with Senator Mike Rounds (R-SD) to discuss the growing movement. IAVA members attending the meeting reflect a wide range of diversity and come from across the country. Attendees included Melissa Bryant, Eric Donoho, Vadim Panasyuk, and Tom Blackburn. “IAVA members are grateful to Senator Rounds for his time today. We were pleased to share the highlights of our ‘Big 6’ campaign with him today and look forward to working with him and the Senate Veterans Affairs Committee and the Senate Armed Services Committee to ensure our members’ voices are heard. 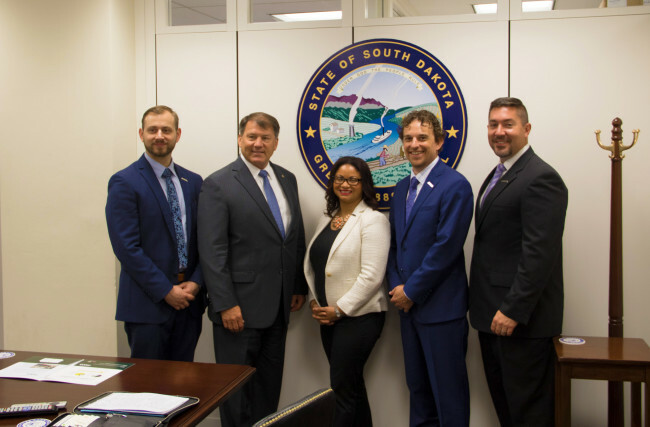 Senator Rounds has been a long time veteran supporter and we appreciate his leadership,” said Melissa Bryant, Chief Policy Officer of IAVA.